First, don't miss Stampin Up's Fabric Frenzy, March 25- 31, all fabric is 50% off!! Check out the nifty fabrics by clicking here. 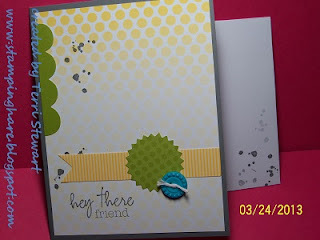 Second, Stampin Up launched it's "smashy" This and That line of products. Capture your moments, thoughts, plans, ideas, sketches, hope, dreams—anything and everything! For a limited time you can purchase a special bundle which includes the five This and That products from the upcoming 2013-2014 annual catalog for 15 percent off! Click here to see these fabulous products. Hurry this offer is only available until April 30th. I've posted 9 new stamping opportunities to my calendar; details below. I hope to stamp with you soon! 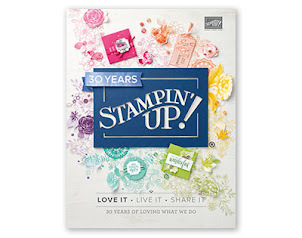 Monthly Stamp Club (third Tuesday of the month), learn new techniques and test-drive the latest Stampiun Up products; receive hostess benefits during your hostess month. Non-members may attend on a space-available basis; tuition is $10 (or FREE with a minimum $25 order). RSVP today! Each month we'll make our kit projects together, plus I'll have 1 or 2 exclusive projects just for my Pumpkin Posse! RSVPs required. 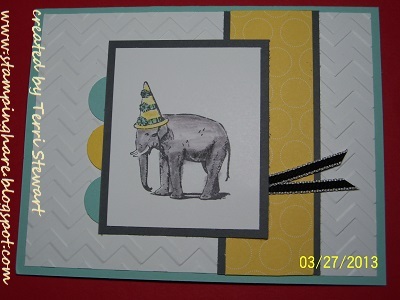 Attached is a photo of this month's exclusive project and a sample card from the kit project cards. Bring your favorite adhesive everything else is included! Join the posse now! Classes (tuition is $10 or FREE with a minimum $25 order, unless otherwise specified); don't wait, contact me today to save your spot! Questions? Call or drop me an email. It's mid-March and you know what that means....St. Patrick's Day! As I am genetically unable to let well enough alone, I made a video tutorial for this card, too. 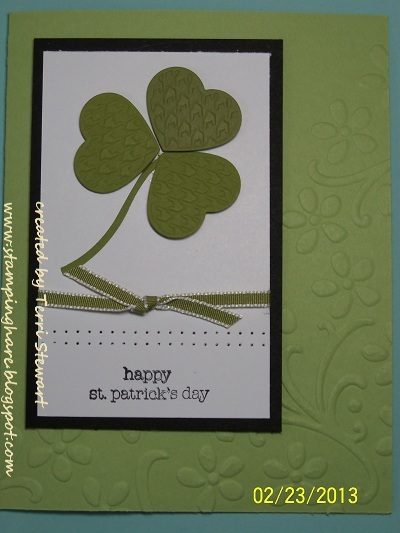 Except in the video, for some reason (I don't want to say it's old age), I used Certainly Celery for the shamrock when the orginal card I made used Old Olive. I think I prefer the Old Olive shamrock. Which shamrock color do you prefer? My favorite Stampin Up time of the year--Sale-a-Bration (SAB)-- is winding down and will soon end on March 22nd. But there is still time to get FREE products! Place a $50 today and you can pick a FREE item from the SAB catalog for FREE. As a matter of fact, for every $50 you spend you get to select another item from the SAB flyer for FREE. I love a bargain and this is one of the best stamping bargains! 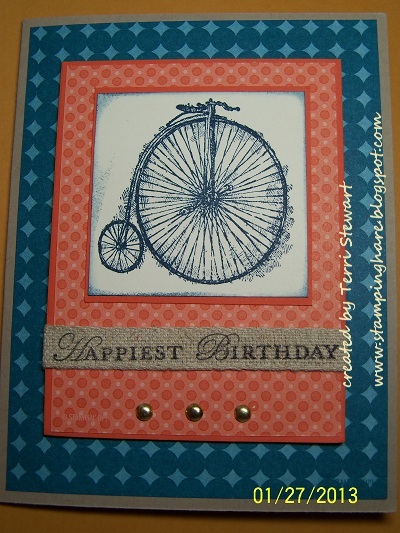 Not only do you get FREE stamping supplies, you can make some beautiful cards with your FREE items. I heard someone say FREE stamps stamp better than ones you spend money on and I have to agree! I was inspired by Patty Snyder's card using the blackboard technique; I copied her card AND made a blackboard technique video. It is an easy technique to learn, plus this card also features several SAB products. I love the products and the card!! If you do not have a local demonstrator, I would love to have you select me for your Stampin Up demonstrator and creative coach. My newest video features several exclusive Sale-a-Bration (SAB) products that come together to make this quick and easy, yet stylish birthday card. SAB ends on March 22 so place an order today and you can pick 1 FREE SAB item from the SAB flyer for every $50 you order. If you do not have a local demonstrator, I would love to have you select me for your Stampin Up demonstrator and creative coach. Thanks! I have a boat load of Stampin Up news to share...and let me just say Stampin Up's 25th anniversary party continues! 1. Stampin Up just announced it is offering a first-time ever go-at-your-own-pace class for purchase; the theme of this class is Stamping Basics. This download comes with pdfs, photos, and videos and is just $14.95! Learn more here. 2. 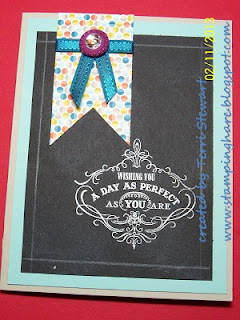 Another first---Stampin Up is offering its first photopolymer stamp set that is just too cute...... a Designer Typeset! These photopolymer stamps offer a versatile all-clear stamping option and are top-quality, giving a perfectly stamped image every time. The stamps stick amazingly well to our clear blocks and are easy to place just where you want them. And best of all, you get to enjoy tons of images for a great price! 3. There is still time to sign up for My Paper Pumpkin and receive the March surprise right to your door; register by March 10th and your exciting crafting project will arrive before the end of March. Select me as your demonstrator when signing up and you'll be in my Pumpkin Posse---every month you can make your projects with the other posse members, plus I'll have other projects just for the posse! 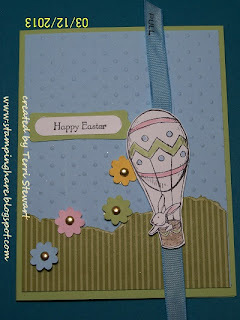 Register at www.mypaperpumpkin.com and remember to select me as your demonstrator. 4. Sale-A-Bration (SAB) continues in until March 22...check out the exclusive, FREE SAB products by clicking here. 5. Join my team during SAB and receive 25% more in your kit. For just $99 you get to pick up to $156.25 worth of fabulous Stampin Up products---and you get to select the products you want, including downloads! Whether you are looking to earn a few extra dollars or just want a fabulous deal on quality crafting supplies, now is the time to join my team. Be your own boss or take the kit and run, either way you get to keep everything in your kit with no strings attached. Learn more here and join today! 6. Hostess codes are now available! This means your friends and family can place orders online and contribute to your stamping party, increasing your party total; plus, their orders are shipped directly to them. During SAB hostesses with at least $150 in orders get a FREE pack of silver glimmer paper; hostess with a $400 show get the glimmer plus 3 items from the SAB flyer---the Madison Avenue stamp set, the Sycamore Street DSP, and the Sycamore Street button and ribbon pack. Contact me today to get your hostess code! 7. The Best of 25 years stamps....every month SU is offering a new themed set of various stamps that were favorites over the past 25 years plus one new image; each set is $14.95. So far the themes are birthday (January), love (February), and flowers (March). All "Best of" stamp sets will be avilable for sale through March 2014; buy 6 "Best of" sets over the coming year and you can pick any $14.95 set for FREE! 8. Two more assortments of never-before-seen single stamps are available through March 31st. 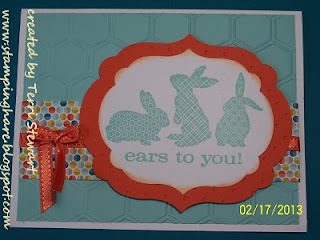 I am featuring one of these stamps, the Ears to You stamp, in my upcoming Easter card class on March 5th. See attached photos. Two seats left, call me today to reserve yours! 9. Limited time offer through April 30th....save 20% when you purchase the exclusive Sent with Love bundle which includes the Sent with Love stamp set and the Sent with Love Designer Series paper (DSP); also available individually. 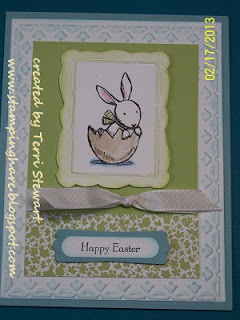 March 5th, 7-9pm, Easter card class, make 4 cards; 2 each of 2 designs; tuition is $10 or FREE with a minimum $25 order. Only 2 spots left, RSVP TODAY! March 19th, 7-9pm, learn new techniques, get hands-on, play-time with the newest Stampin Up products. Each club member receives Hostess benefits of at least $25 once during the 6-month club. Limited space, call today to join this fun club!